Gawker property, it’s an ad campaign for the HBO show True Blood. members (save for the vampire obsession). Gawker will produce content for the site until True Blood’s season premiere June 14, but its existence got the blog empire into some trouble last week when it was mistaken for editorial content. Why? Because it works. As online advertising has been feeling the squeeze of the recession, publishers and marketers are desperate for new ways to get eyeballs looking at their content. The gray area between edit- and advertorial is likely to blur even further. While print media has always struggled with how to handle advertorial, online publishers are getting much more comfortable with its existence. American Express currently pays high profile bloggers like Guy Kawasaki and John Battelle to put their technology content on its sponsored site Open Forum. Meanwhile, brands like Proctor & Gamble public interest sites like Baby.com and BeingGirl.com mostly to schill their products. The new iPhone will be released on June 19th, and while data upgrades, new features and lower costs makes the product attractive to new users, current iPhone owners may experience sticker shock when they try to upgrade on June 19th. AT&T customers purchasing an iPhone for the first time will be able to get a 16 or 32GB phone for $199 or $299. But many customers in the middle of their AT&T contracts for first or second generation models will have to spend $399 and $499 to upgrade. supporting the network-sucking smartphones, it looks as if AT&T is focusing on growing the iPhone user base at the cost of customer loyalty. 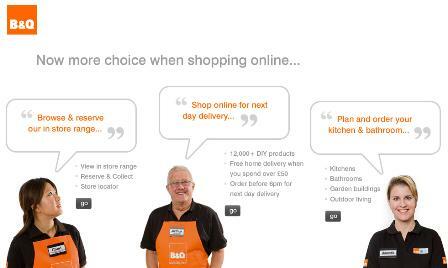 Does B&Q really need a site intro page? B&Q recently launched a standalone next-day delivery service which is designed to compete with retailers such as Screwfix. Problem is, it has also introduced a kind of into / portal page for visitors to choose which B&Q site they want to use. TK Maxx has started to sell online in the UK, but the discount retailer is taking a cautious approach, and is only offering handbags for sale on the site so far. The company is asking for feedback from customers on what else they would like to buy from the site though, so it seems that other product ranges will follow.